During Spring Break of 2011, Eric Langenderfer, a former student of mine approached me about integrating lecture videos into the classroom. He had taken a journalism class here at Ohio State where he was assigned to produce a video documentary and during his last quarter at Ohio State he wanted to utilize all the resources from the digital union on campus with hopes that he could gain enough experience to do some side video work during medical school. 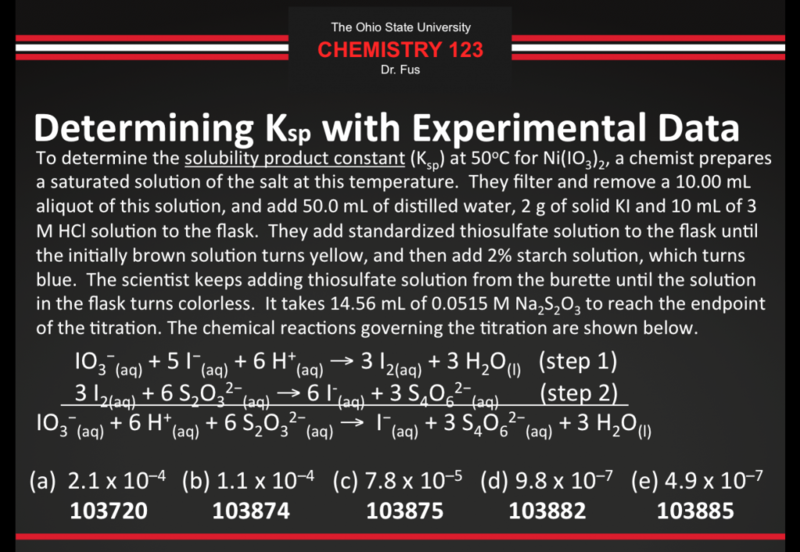 I started flipping in my Chemistry 123 class during the summer of 2011 and began to develop the best way to implement it in a general chemistry classroom at Ohio State. Here is a video highlighting the way I teach, which includes student comments. 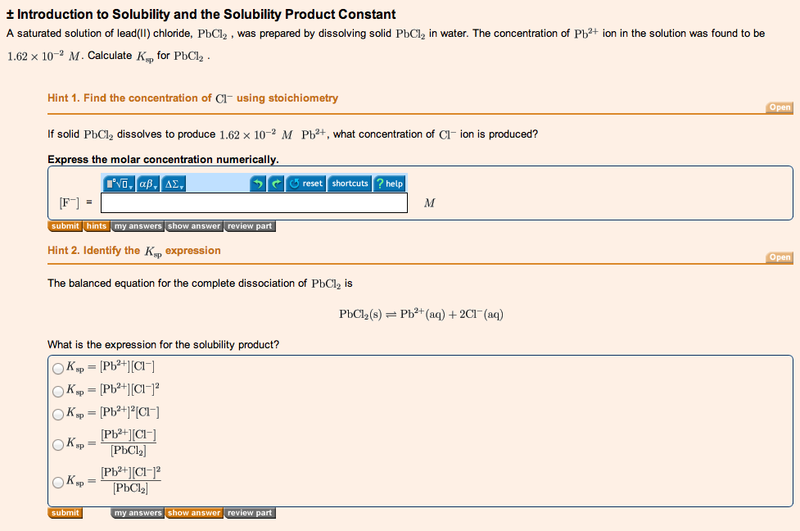 I have taken the following from a typical solubility lecture from the content of Chapter 17. Students should always check their course checklist to keep on track. 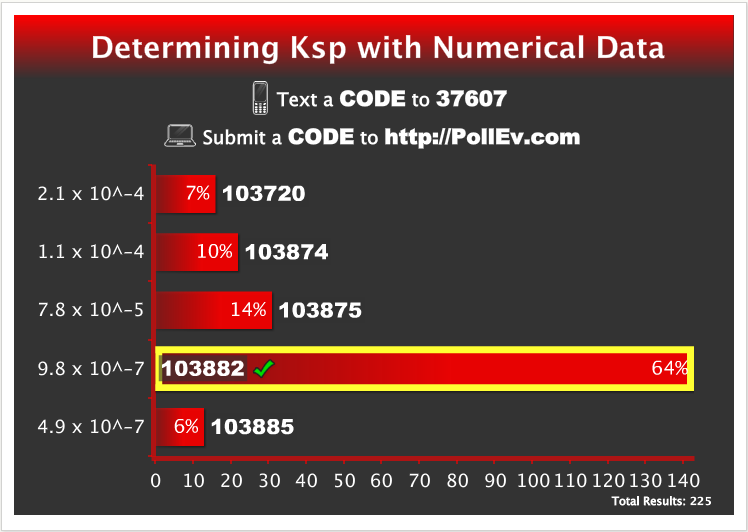 The checklist is letting you know that we will begin lecture by discussing the Ksp Lab followed by a questions on Determining a Ksp from experimental data and Stoichiometry of the Ksp lab (we didn’t get to that question today, but it will be covered in the example problems of the Ksp lab). These results indicate that 64% of the 225 students who responded received one point towards their lecture problems grade. 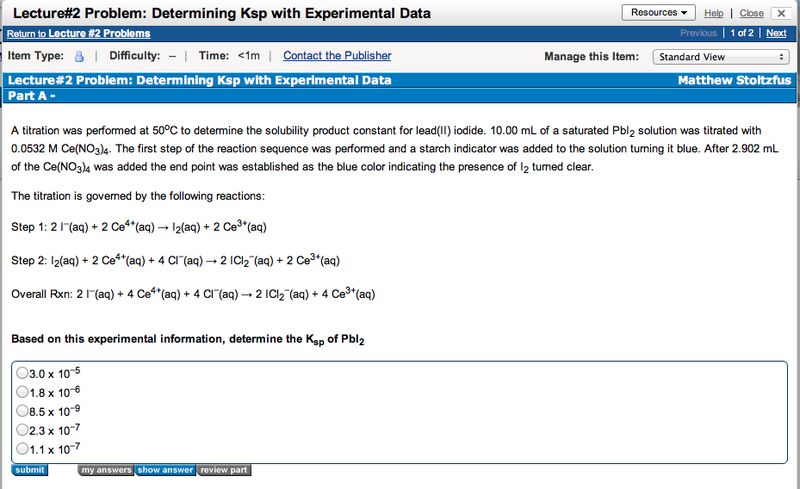 If you did not respond or you did not enter the correct response then you can earn a point by correctly answering the “Determining Ksp with Experimental Data” Mastering Chemistry question. 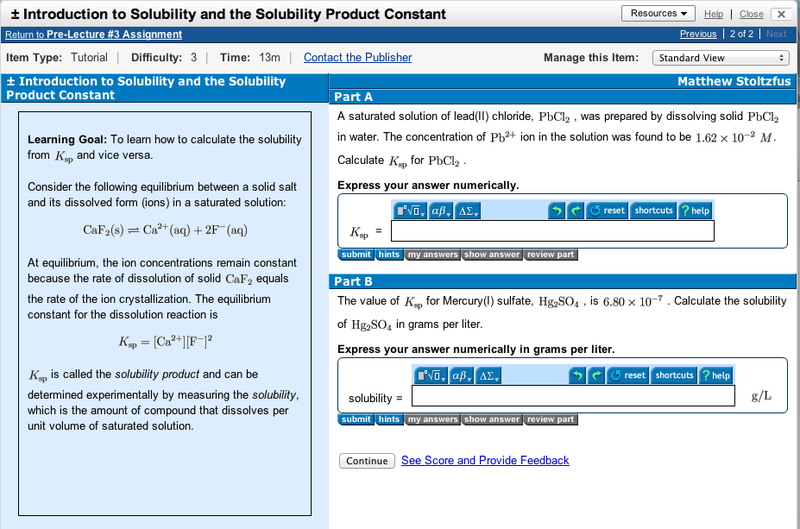 Since I worked out a similar problem in lecture you can now use this information to work through the Mastering Chemistry problem until you arrive at the correct answer. This will allow you to earn the point that was missed in the lecture question. These questions will be due at the beginning of the next lecture and I highly encourage you to use them as practice problems even if you answered the question correctly in lecture. If you happen to miss lecture because you were sick, your alarm didn’t go off, you were hungover, your grandmother died, it was too cold outside, you have an athletic event, you have a conference to go to, you were leaving town early, or for whatever your favorite excuse is, then you know the content we covered in class and you can go to Mastering Chemistry to keep up with what was missed. To prepare yourself for the upcoming class, go back to the checklist and see which videos you need to watch. These hints will guide you through solving the problem and you will not be penalized for using them. I would encourage you to try to solve the answer first on your own and then use the hints if you get stuck. Each tutorial problem will be worth one point toward your Lecture Problems grade. When the quarter is over, I will add up all of your Lecture Problem points and they will be scaled down to make up the Lecture Problems portion of your final grade. In each of these problems you have unlimited attempts and can utilize any of the hints available. Then the cycle repeats itself for each lecture. Click the following link for a full breakdown of the Spring Semester of 2013.